Ok, practically all of us have heard of or read Anne Riceâs Vampire Chronicles; I mean the woman is pretty much a living legend. 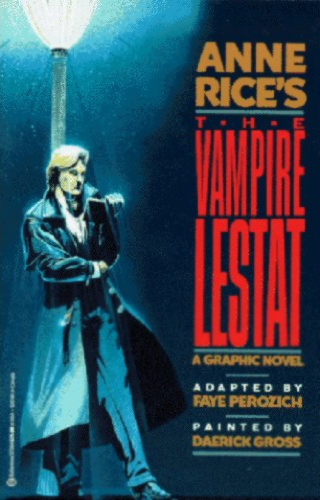 I bet many of our readers have every single one of Riceâs vamp books sitting on their shelves – but, do you have The Vampire Lestat graphic novel? For some reason very few people have heard of the Lestat comic, which is a shame since it rocks. The graphic novel is actually a collection of twelve separate illustrated volumes adapted byÂ Faye Perozich. There are a handful of talented artists involved in the book – some of which are incredible, othersâ¦not so much. I admit, some of the art is hideous but then other parts done by other artists are stunning. If you are a big Anne Rice fan then this is for sure something you should pick up. You canât find it in stores anymore but you can buy it from online sellers. But if you do buy it be careful who you buy it from. Some sellers claim that this novel is âSUPER RAREâ then charge $100 for it, which is insane because you can find it for under $10 used and in good shape. Bought mine here in Canada about ten years ago at the Waterloo Chapters Bookstore. It still pops up from time to time.